Here comes week 3 of my Whole30/Paleo month! There might seem like a lot of ingredients this week, but you should still have a lot of the pantry items leftover from weeks 1 & 2. If you need a quick refresher on the difference between Whole30 and Paleo, here goes: Whole30 is Paleo but not all Paleo is Whole30 because Whole30 is a more restrictive version of the the Paleo diet. Whole30 is a 30 day diet that is meant to restart your system whereas paleo is meant to be more a lifestyle. There are some differences in what you can eat as well, specifically sweeteners like honey and maple syrup. But I’ll point it out in the recipes so ya know! 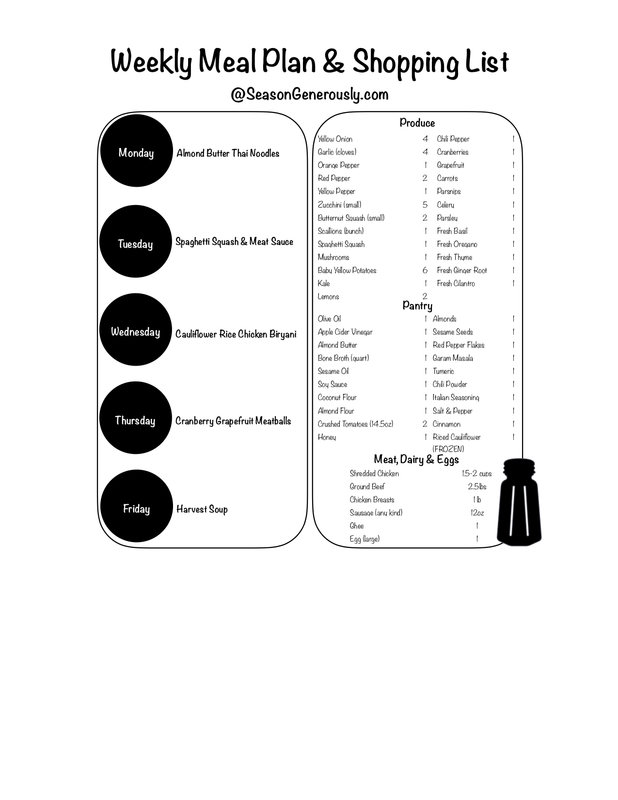 Click here for this weeks meal plan and shopping list or the picture below!